Now I am become Death, the destroyer of worlds. – Valerie Jarrett? 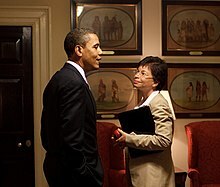 Reports resurface of Obama aide Valerie Jarrett forging a secret deal with Tehran as Saudi Arabia reportedly mulls helping Israel destroy Iran’s nuclear facilities. Unlike the U.S., the Saudis recognize the threat. Israeli television reported Sunday night that Iranian-born White House senior adviser Valerie Jarrett negotiated a one-year-in-the-making deal with the head of Iran’s Atomic Energy Organization, Ali Akbar Salehi. That would render the Geneva talks now taking place between the so-called P5-plus-one group ( the U.S., Britain, France, Russia, China, plus Germany) and Tehran a meaningless facade. But everyone knows that this White House lies by reflex. Valerie Jarrett is the one-who-decides, not Obama. Whether fact or rumor, it aggravates the fears not only of Israel but of the Mideast’s saner Islamic regimes. For years, the Israelis, the Saudis and the Egyptians have seen a U.S. president conduct an Iran policy based on applying economic sanctions to fanatics who care little about the well-being of their countrymen, and on the notion that Islamofascists who await the coming of the 12th imam to lead an apocalyptic war against Israel can be reasoned with. So it isn’t tremendously surprising to read the London Sunday Times report that Riyadh would let Israel fly over its airspace to bomb Iran, plus help out on rescue helicopters, tanker planes and drones. No sooner had the Sunday Times published this information than Saudi Arabia denied it – of course. And perhaps the Saudis will now disallow Israel to use its airspace. The chances of the strange co-operation between these enemy states continuing are, however, quite good. A diplomatic contact told the British newspaper, “The Saudis are furious and are willing to give Israel all the help it needs.” The Saudis indicated several weeks ago that their relations with the U.S. had been breached by President Obama’s overture to Iran. According to the Times, “Israel’s Mossad intelligence agency is working with Saudi officials on contingency plans for a possible attack on Iran” if a deal in Geneva doesn’t do enough to curb Tehran’s nuclear program. The Saudis and the Israelis understand that Iran cannot be appeased out of becoming nuclear-armed. Unfortunately, we have a president intent on doing just that. According to a recent news report, President Barack Obama has for over a year secretly conducted negotiations with Iran (through his adviser Valerie Jarrett) and the Geneva talks on Iranian nukes now appear to be just a facade providing international legitimacy for Obama’s secret deal with Iran. Secretary of State John Kerry’s contradictory criticism of Israeli objections to that deal only suggests more bad faith by the Obama administration. On the issue of Iranian nukes, France has effectively replaced the U.S. as Israel’s strongest ally and as the most sober-minded advocate of caution when negotiating over the single greatest threat to global security. Incredibly, Saudi Arabia is reportedly replacing the US in providing logistical support for an Israeli strike on Iranian nukes. Yaakov Amidror, Prime Minister Benjamin Netanyahu’s former national security adviser, recently indicated that the Israeli Air Force has been preparing for a potential strike on Iran. According to Amidror, such a strike could set back Iran’s nuclear program “for a very long time.” So Israel can go it alone, if it must, although the results will be far messier than those produced by a stronger U.S. approach. 1) The Treaty on the Non-Proliferation of Nuclear Weapons (NPT) will effectively be finished. The world’s most volatile region will become even more explosive as other regional players scramble to establish their own nuclear arsenals to counter Iran’s. And rogue nations will realize that by following Iran’s deceptive playbook, they too can develop a nuclear capability. 2) The force of U.N. Security Council Resolutions will be further diluted, as Iran will continue flouting six of them with impunity. 3) Iran-backed terrorist organizations — including Hamas, Islamic Jihad, and Hezbollah — will grow emboldened by the nuclear umbrella of their patron. 4) Terrorism could go nuclear, should Iran share some of its nuclear materials with the terrorist groups that it supports. 5) U.S. influence in the Middle East will erode even more, as Obama further damages U.S. relationships and influence in the region. 6) U.S. credibility throughout the world will plummet. If the U.S. cannot be trusted to provide strong leadership on the national security issue of greatest concern to the free world, where U.S. interests are directly at stake, what does that mean for U.S. credibility more generally? 7) Global instability and oil prices will skyrocket. If Israel, with Saudi assistance, strikes Iran’s nuclear program, the Iranian retaliation that follows could spark World War III. Will Iran attack Saudi oil fields or otherwise pour more fuel onto the Sunni-Shia fire in Syria? Will Iran and Iran-backed Hezbollah (estimated to have at least 45,000 missiles) launch a massive attack killing thousands of Israeli civilians? Will some of the Syrian chemical weapons held by Assad (another Iranian ally) end up hitting Israel? How would Israel respond? Is this how Armageddon happens? 8) U.S. interests will be attacked. Obama may think that his policy of appeasement will shield the U.S. from Iranian reprisals, but the opposite is true. When the U.S. appears so weak and ready to abandon allies (as with Egypt, Israel, and Saudi Arabia), Iran has less fear of attacking the U.S. and more reasons to do so, as a way to exacerbate U.S. tensions with Israel. Will attacking U.S. interests be yet another Obama “red line” that gets crossed with impunity? If so, then whatever is left of U.S. deterrence and credibility will have been destroyed. If not, then the U.S. will get sucked into another Mideast war but on terms dictated by the adversary, and without any first-strike advantage. Obama should know by now that if he forces Israel’s hand, then Israel alone will neutralize the Iranian nuclear threat, regardless of how messy the aftermath may be. We wish we knew that! What we perceive is that if “Armageddon” develops from this chain of events, its mastermind is one Valerie Jarrett. And religious doom-predictors should note that nobody ever prophesied a 57-year-old woman, elected by nobody and representing no constituency, will launch the destruction of the world.